The story of the eponymous young woman of the play, Katie Roche, is often unbeknown to Irish theatre audiences. Lesser known still is the story of the play’s author, Teresa Deevy. One could be forgiven for confusing the stories of both women, Roche and Deevy – their stories interchangeable where either’s considerable talent and ability were left unfulfilled by demonstrable forces beyond their control. Authority has a habit of getting in the way. Such was the case for both Deevy and her play Katie Roche. First performed at the Abbey Theatre in March 1936, the play’s opening night review in the Evening Herald included the following remarks: “The point of the play, if point there is, is most evasive. It seems to be little more than a clever psychological study of a girl who gives her name to the piece.” This critic who describes Katie as a “complex creature as near to insanity as makes no difference” spent most of the review trying to define Katie herself, describing her as full of “gamin elfishness . . . queer, fiery, and at times a pitiful character.” We are still left quite unaware of Katie's story or of who she is or the fate that befalls her. Deevy’s play presents a young woman, Katie, who as born out of wedlock, is depicted as someone who is somehow, incomplete, unknowable or wild. In marrying an older man, Stanislaus Gregg, an artist of renown, Katie untimely succumbs to the pressures of conformity, to a play ' a role' as a wife and within a family. 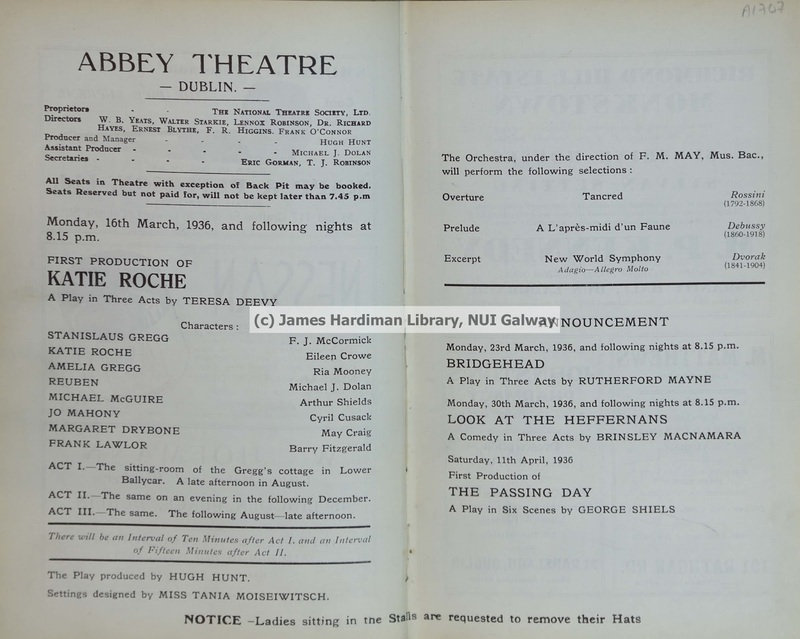 In one of the last entries to the minute books, on the 28 April 1939, Teresa Deevy, the playwright who gave the Abbey one of their most successful plays of the thirties in Katie Roche, is rather mysteriously dismissed from her contract. Previous academic research has tended to place Deevy’s break with the Abbey in the early 1940s, when she submitted Wife to James Whelan which was rejected by Blythe, but here is evidence that in response to her inquiring about her play Holiday House, which had been accepted by the board a year previously, the board decide not to produce it ‘and agreed that the contract with Miss Deevy should be allowed to lapse’. This terminology is not employed elsewhere in the minutes and no explanation is given for the dropping of one of their most popular and critically acclaimed playwrights. Deevy’s involvement with the Abbey theatre, as a playwright of other new work at least, ends with Katie Roche. 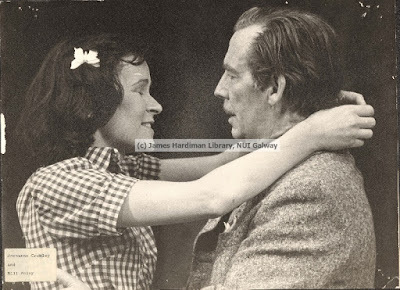 After its premiere in 1936, the play was revived in 1937, 1938, 1949, 1953, 1954, 1975 and 1994, before being revived currently on the Abbey stage in 2017. 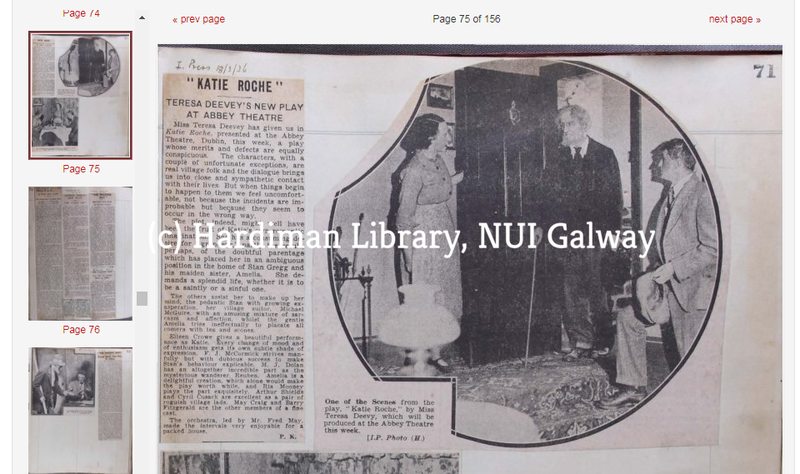 The production history and records of the play, newly digitised for the first time at NUI Galway, reveal how this play, much loved by its original audiences has faded into a sporadic production over the subsequent decades. 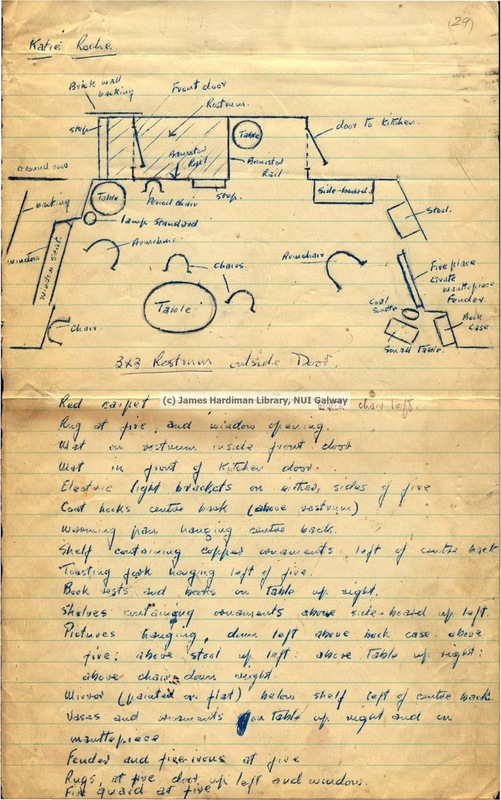 From the original production, the stage management files, revealing sketches and drawings of the stage and set, lists of props, cue-sheets for lighting and sound, also included detailed annotation down to the detail of the colour of carpets and curtains used on set. In the absence of photographs, for example, these records are an invaluable account of the original staging which was produced by Hugh Hunt and designed by Tania Moiseiwitsch and provide evidence as to why it struck a chord with both audiences and to those who may have considered Katie “a wild” and dangerous figure for modern Ireland. Later records, such as prompt-scripts, give further opportunity to follow how the play was and could be mounted, giving an indication of the craft of Deevy the playwright and evidence as to just why exactly she was known as a playwright of such ability before her contract was “allowed to lapse” in such a crude manner. Audio visual records, such as audio files from productions in the 1980s and 1990s give a chance for the first time to hear how the play was scored and a how music and affects were integrated into the production. 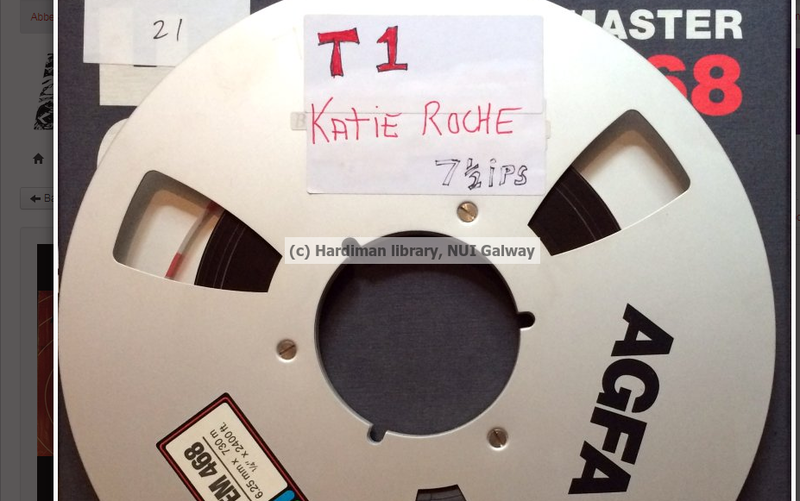 A video recording of the 1994 production of Katie Roche, on the Peacock stage, starring Dearbhla Crotty in the titular role of Katie, brings the archive story of the play full-circle, allowing us to watch, hear and experience, as far as possible, the play in action and brought to life from the past. More than eighty years after the play was first performed, the archive and records of the play’s production and its reception can bring us closer to knowing more about the complex stories of both Katie Roche and Teresa Deevy. 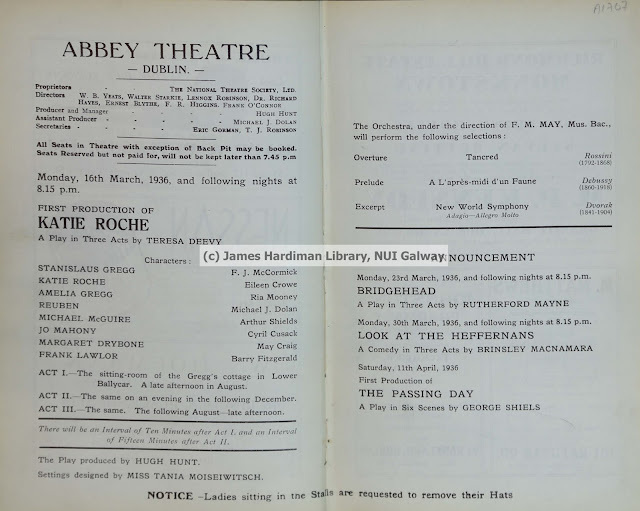 The transcribed minute books of the Board of the Abbey Theatre 1904 - 1939 are available here. The Cambridge Edition of the Works of Ben Jonson Online is now available. The print edition was published by Cambridge University Press in 2012. 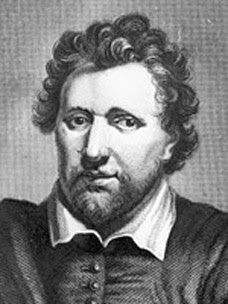 The Cambridge Edition of the Works of Ben Jonson Online contains a wealth of additional content, including the recently discovered diary of Jonson's 'Foot Voyage' to Scotland, extra letters written to Jonson, early attempts at a biography, further material relating to the masques and poems and numerous contemporary references to Jonson's works and reputation. This resource can be accessed via the library catalogue or directly via the link here. Fulltext access to every issue of Journal of the Marine Biological Association of the United Kingdom from Volume 1, Issue 1, 1887 onwards is now available. Journal of the Marine Biological Association UK (JMBA) is an international journal, publishing original research and reviews on all aspects of marine biology, to support the aims of the MBA. This journal can be accessed via the library catalogue or directly via the link here. The Library has acquired permanent access to Oxford Bibliographies International Law, one in the series of the highly regarded Oxford Bibliography research tools. "Oxford Bibliographies in International Law is designed to provide authoritative guidance and help researchers filter through the proliferation of information sources to material that is reliable and directly relevant to their inquiries. It will provide a trustworthy pathway through the thicket of information overload." The resource can be located through the Library catalogue or directly through the link here. The Library will be closed on Sunday 6th August, however the Library Reading Room at basement level will be open daily as normal from 07.00-02.30 over the entire weekend. There is currently a problem accessing fulltext content on ScienceDirect while off-campus. this seems to be a global issue affecting all institutions. ScienceDirect Tech support are aware of the issue and are working on a fix. This blog post will be updated when access has been restored; our apologies for the inconvenience. In the first blog post I wrote I spoke about the various stages of the work that an archivist does in preparing a collection to make it accessible in the reading room. I am now down to the last of the boxes and files in the arrangement phase. 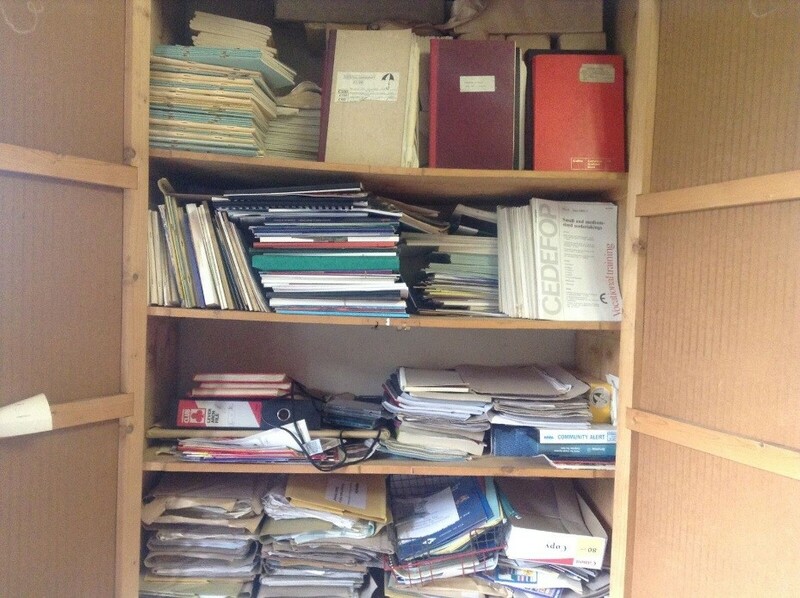 The time it can take to arrange an archive can vary depending on the size of the archive and the order in which the material is in the archive. During the arrangement phase archivists look to keep and respect the order that the creators arranged their own records. In archival terminology this means that I look at the Muintir na Tíre collection as a fonds. This comes from the term respect des fonds, an archival principle which tells us to acknowledge the source, or provenance, of records when we are arranging them. By maintaining the original order we can learn a lot more about the organisation and the records and how Muintir na Tíre worked. However, this is not always easy to do especially when you receive a collection has been stored like this and no original order has been kept. Another aspect that makes it hard to appraise and arrange the collection and follow the archival principles described above is when you get a bundle of loose papers. It requires a lot of patience and skill to arrange the material and put some order on it and make sense of the material in the bundles. My work as an archivist is to help put order on the archive especially the messier aspects of it and provide sense of the records but also help researchers make sense of it. The Muintir na Tíre archive as stated in my first blog was partially organised. This work was done by Tom Fitzgerald. Tom Fitzgerald worked in Muintir na Tíre for over 60 years and was the main administrator and was the creator and keeper of the majority of the files within the archive. Building on this work I will provide further sense of the archive. But what does this actually mean? This means that as I am arranging the Muintir na Tíre archive (fonds) that it will be divided into series and subseries which are groupings of the records based on function or theme or subject. 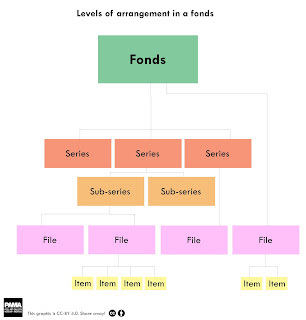 The series or subseries would then have files which includes items within them. A description will be provided for at the top level and or the file level of the collection. Each file will also be provided with a reference number. The archive uses archival management software to create our catalogues/finding aids and publish the catalogue on line. To view the catalogue go here. I hope that this blog has given you a further insight into the work of an archivist as we are progressing through the Muintir na Tíre archive and end one phase and begin another. In this workshop we will be delving into the world of Digital Video. Video is fast becoming a way in which people learn and interact, with 6 out of 10 people preferring online video platforms to live TV. YouTube is one of the most popular and most used video sharing platforms, in an average month, 8 out of 10 18-49 year-olds watch YouTube. 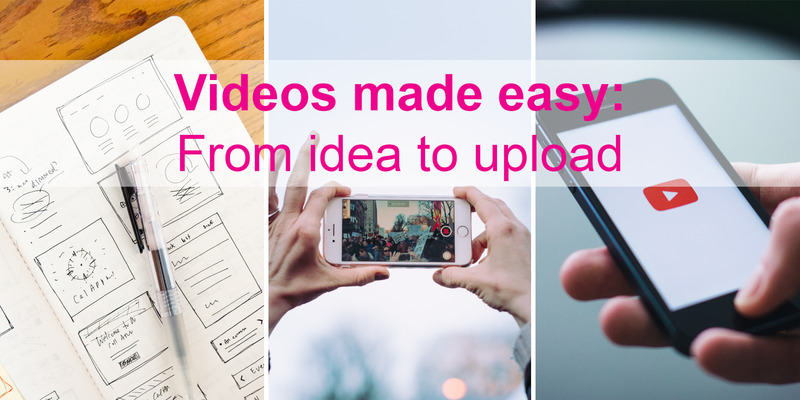 Video is fast becoming both a creative outlet and an essential tool for teaching as well as disseminating research. In this workshop we will be looking at idea generation and planning for creating digital videos. During this workshop we will also cover some tips and tricks for filming and editing. Learning these skills will help in the creation of your digital video whether you are creating an artistic or academic video. Eileen Walsh, the facilitator, has a degree in Graphic Design and a masters in Digital Media. She has worked in the area of design and digital media for the last seven years and will be sharing some of the knowledge and tools she uses when going through the design process.